LED « Tech bytes for tea? The ASUS LolliFlash is an ultra-portable external LED flash for taking smartphone selfies in dim light. The LolliFlash comes with dual-LED light and multi-colour filters for a fun photography experience. 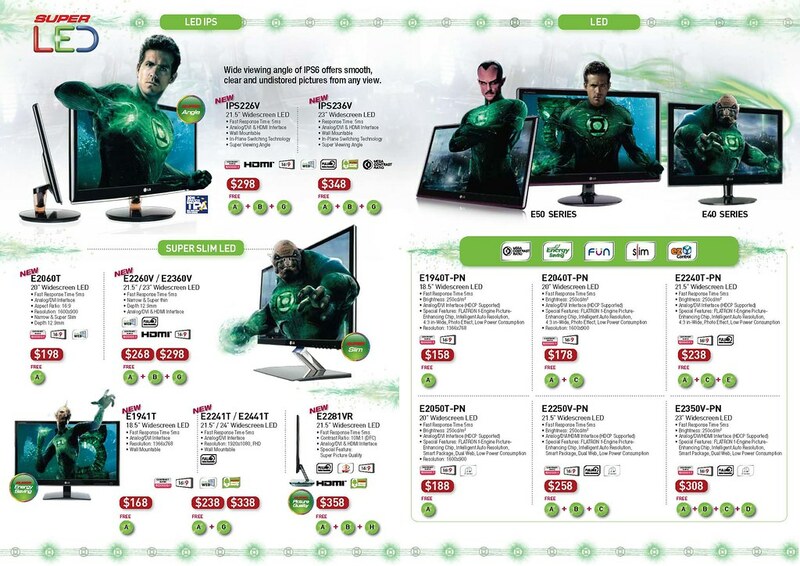 Available from today at S$17.90 at ASUS Online Store. ASUS LolliFlash dual-LED light with three colour filters for taking smartphone selfies. Shown here with an ASUS ZenFone2 but compatible with any Android smartphone. Many smartphones today ship with an LED flash for the main camera at the rear for taking photos in dim lighting. The filter sleeve merge the light from the two LED light sources. Most smartphones, however, do not have a front-facing LED for taking selfies with the front camera. The new LolliFlash from ASUS addresses this need for avid selfie photographers. The LolliFlash is a compact dual-colour LED light that can be easily attached to any mobile phone to provide ample light in low light conditions, promising realistic skin tones in every photo. Small and lightweight at only 8g, the wireless LolliFlash can be placed anywhere on the phone. Casio Singapore has launched a lamp-free Casio XJ-V1 projector equipped with a Laser and LED Hybrid light source offering higher energy efficiency and bigger long term cost savings suitable for educational institutions and businesses. Available in Singapore by Q2 2015. Price TBA. The new lamp-free Casio XJ-V1 Laser and LED Hybrid light source projector. The XJ-V1 is the latest in Casio’s line of Laser & LED Hybrid light source projectors that performs effectively in classrooms, conference halls or boardrooms. The XJ-V1 starts up and shuts down almost instantly and achieves full brightness in less than five seconds, enabling users to work more efficiently. These indoor farms grow vegetables sustainably and locally in areas where traditional field farming is not possible. The lighting system uses 85% less energy than traditional systems. Feeding the growing population with Philips city farming. Royal Philips has partnered with Green Sense Farms (GSF), a Chicago-area commercial grower, to develop one of the largest indoor commercial farms using LED grow lights tailored to their specific crops. “By growing our crops vertically, we are able to pack more plants per acre than we would have in a field farm, which results in more harvests per year. We produce little waste, no agricultural runoff and minimal greenhouse gasses because the food is grown where it is consumed,” said Robert Colangelo. This innovative farming model allows them to harvest 20-25 times a year by using ‘light recipes’ optimised for their produce, using 85 percent less energy. The result will be an increase in crop yields and reduced operating costs, while providing consumers with locally grown, fresh vegetables throughout the year. GSF is located in a small town called Portage, which is very close to Chicago. GSF has invested millions of dollars to renovate and equip a million cubic foot indoor growing area consisting of fourteen 25 foot tall growing towers in two climate-controlled grow rooms. These rooms use Philips energy-efficient LED solutions tailored to their specific crops. This method also eliminates the need for harmful pesticides, fertilisers or preservatives, resulting in produce that is organically grown and virtually chemical free. Luxury German brand Metz has introduced its new slim line Metz Caleo range of 3D LED televisions in 47-inch (S$8,500) and 42-inch (S$7,600) screens. Prices include GST. Premium LED, mecavisionHD+ and 200 Hz technologies make images come to life with large spatial depth, while the integrated 750 GB hard disk recorder allows 2D or 3D content to be viewed independently of the programme schedule. The new Metz Caleo 3D LED is available only at the Schmidt Marketing Flagship Store in Ngee Ann City Tower A, #05-33.The prices include the TV, table base OR wall mounting, and 2 pairs of 3D glasses. The retail price of each pair of 3D glasses is $100. Dynamic motion compensation (DMC) displays rapid movements in perfect clarity, even from HD sources. A 3D comb filter and cross-colour reduction provides brilliant images. The mecaSoundpro sound system and a highly efficient 2-way bass reflex system combine to provide rich, immersive sound. The integrated Metz Media System enables the display of photos and videos, playing of music, as well as access to online services. An LED backlight makes the TVs eco-friendly by optimising energy efficiency. I had the chance to try out the 23-inch LG2360V LED LCD monitor for the past two weeks. Pretty bright and pin sharp display, and easy to set-up. I’ll be doing a more in-depth review when I get back from Germany at the end of the month. For now LG’s promoting their monitors at the ongoing PC Show. 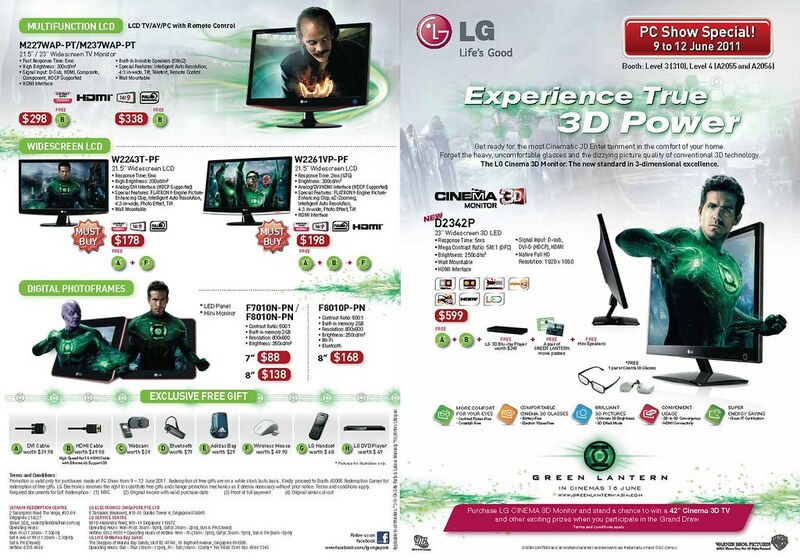 The LG2360V is going for S$298 along with some free gifts.